For day three, I opted for a more minimalist yet chic look because this day involved some prescheduled work, long metro rides along with AIFWSS17. So I picked up this cropped denim vest and paired it up with high waist cotton pants. 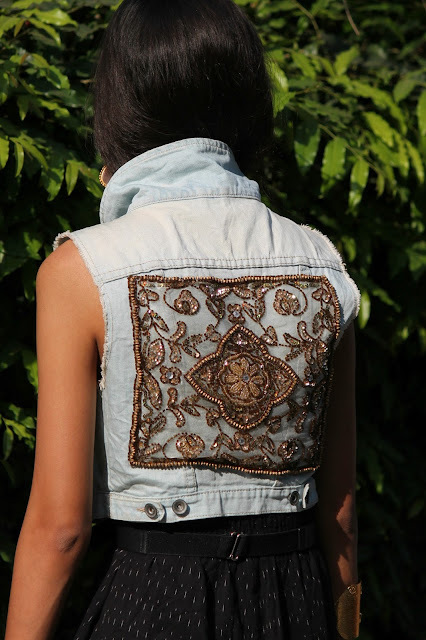 What attracted me the most about this vest was its back, intricately embroidered with beads & sequins in antique gold. 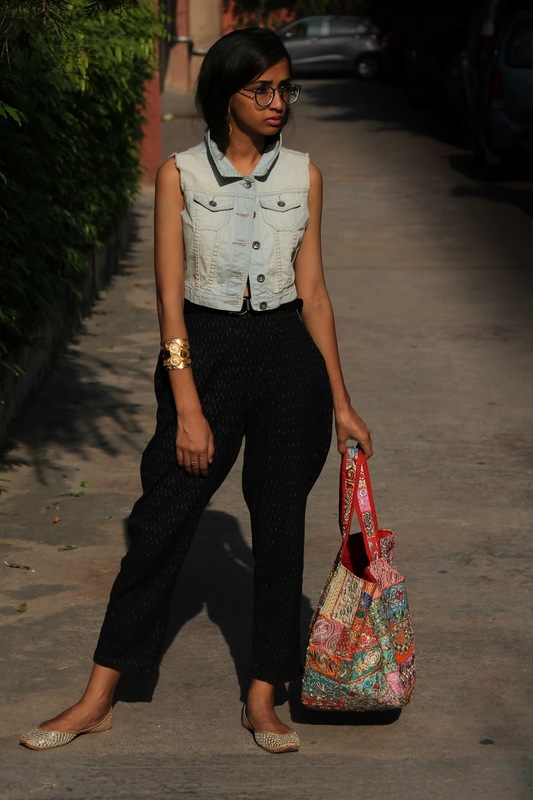 Added Indian vibes in form of an oversized handcrafted bag and mirror juttis. 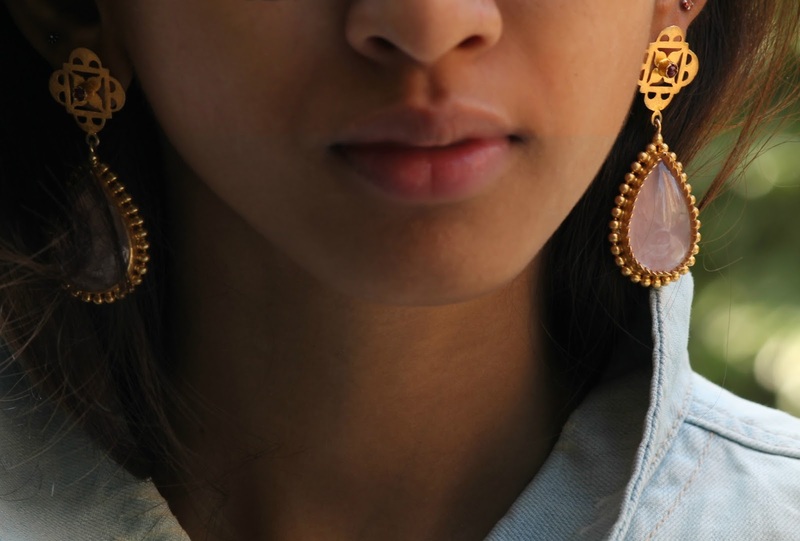 I decided to accessorize this outfit with these dainty dusty pink earrings and a coin embossed cuff. Nothing OTT! 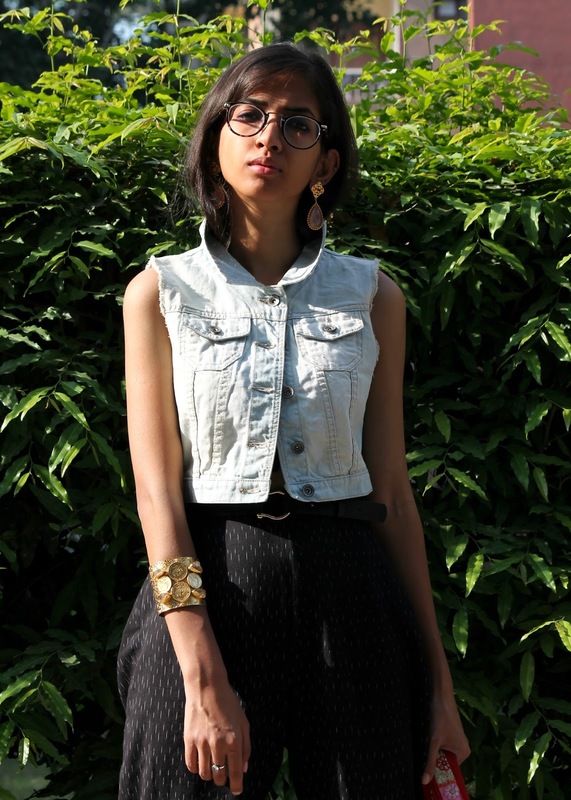 For hairstyle I chose a sleek look & sported a popped collar to keep my frizzy hair at bay. Day 3 of #AIFWSS17 was a riot of florals, metallics, ruffles and more, with every designer showcasing amazing collections with full summer vibes. With HUEMN opening for the day, it was indeed a great start. 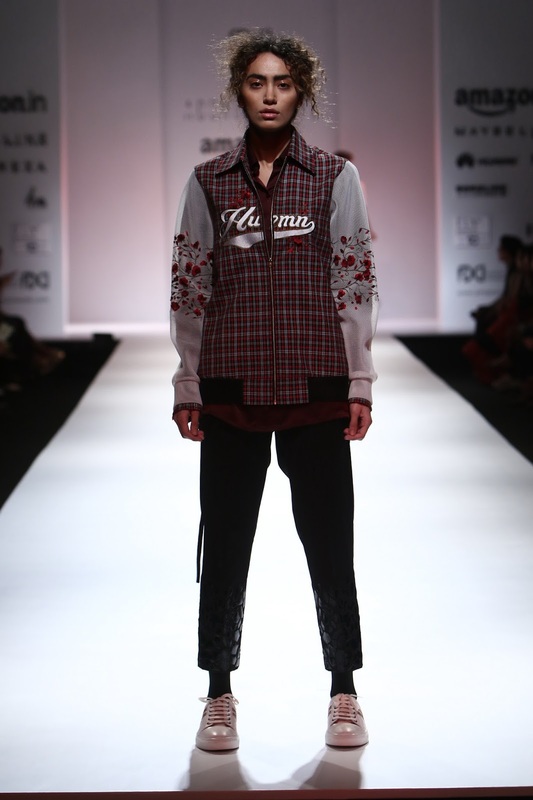 The collection included pantsuits, bomber jackets and more depicting an uber cool blend of androgyny and athleisure. This was followed by IKAI by Ragini Ahuja, whose collection had some stunning prints and unique silhouettes. What I really liked about ILK by SVA was the color palette used and attractive sheer work. 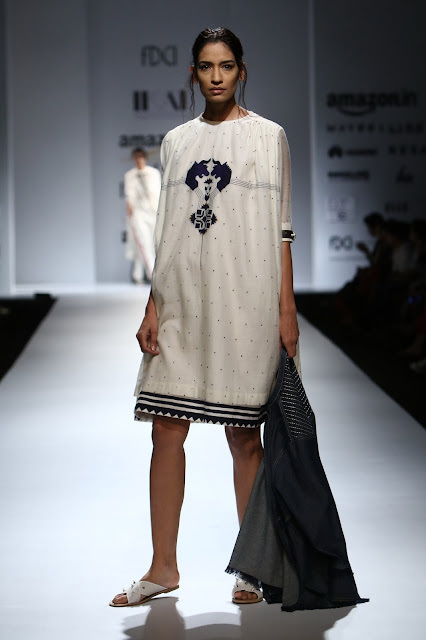 Anupamaa Dayal's collection 'The Pirates of Calcutta' was absolutely a colorful extravaganza that screamed beach vibes! 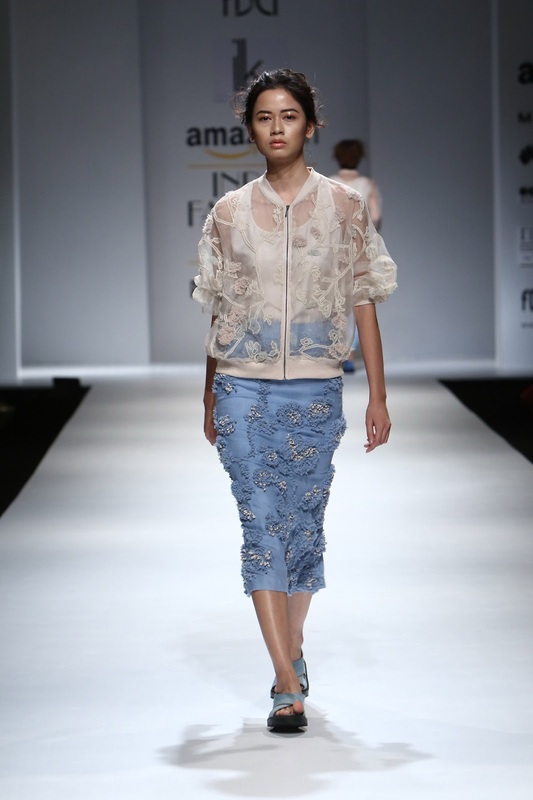 While Kavita Bhartia stuck to India silhouettes with beautiful embroidery & lace details being the highlight of the collection. Up next was Sanchita's 'Tropical Garden' which was inspired by prickly cacti & orchids. This collection would definitely be one's go to wardrobe add-on this summers! Gauri and Nainika's show was my *the most favorite* up till now, hands down! Their patent ruffled creations made using vibrant colors was indeed magical. The use of harnesses & belts was the added charm to the collection! Malini Ramani's collection, on the other hand was more wearable, had beautiful prints & chic silhouettes. Eclectic, to say the least! 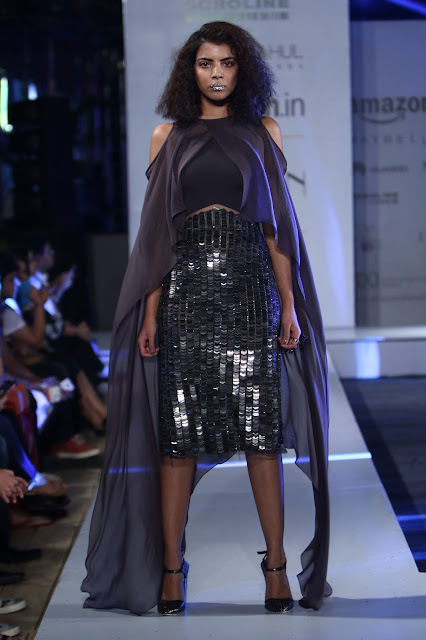 The day ended with a metallic quotient with Rohit Gandhi And Rahul Khanna's 'Scions of Skin' which showcased power dressing with constructed silhouettes, asymmetrical cuts etc. And you cannot miss those glittery lips!